In 1833 the Chelsea neighborhood was just forming into a new residential district. That fall the New York Presbytery agreed to establish a mission church on Eighth Avenue to serve the few Presbyterian families who were "endeavoring by occasional prayer meetings to keep the Christian flame glowing in their hearts." The Eighth Avenue Church was organized on February 9, 1834 in a rented space at No. 189 Eighth Avenue. As the Chelsea population and the congregation grew, the Eighth Avenue Church moved three times before breaking ground for a substantial structure at No. 208 West 23rd Street. The building was dedicated in 1854, with the congregation renamed the West Twenty-Third Street Presbyterian Church. In 1889 the church merged with the Westminster Presbyterian Church, located on West 22nd Street since 1856. The combined congregations became the Westminster Church of West 23rd Street. But trouble was on the horizon. In 1905 dissension broke out between the trustees and the congregation at large. The infighting became so heated that the New York Presbytery dissolved the Westminster Church in 1908 and its building was shuttered. The ugly rift finally ended up in the New York Court of Appeals in 1924, known as the Westminster Church Case. With court's permission, the Presbytery organized a new congregation with 100 former members of the Westminster Church. It moved back into the 23rd Street building with the new name Chelsea Presbyterian Church. Under the modern-thinking pastor Rev. Thomas Harvey Whelpley, Chelsea Presbyterian struck out on a startling project--a "skyscraper church." In 1926 the venerable church building was demolished to make way for a modern residential and transient hotel that would include a church auditorium and related facilities. Church officials marketed the idea as a sign of things to come. Rev. Theodore F. Savage remarked "We are doing that which is going to be done from here to the Pacific Coast." But not everyone liked the jazz-age concept. The New York Times editorialized, "Must we visualize a New York in which no spire points heavenward?" Emory Roth, known for his Art Deco apartment buildings and hotels, was given the commission to design The Carteret Hotel. (Confusingly, the name was said to honor the last surviving signer of the Declaration of Independence. That, however, was Charles Carroll, and the only prominent Carterets in the New York area during the Revolution were ardent Royalists.) Roth produced an 18-story Art Deco take on a Tuscan villa. A two-story limestone base provided hotel access, under a handsome metal and glass marquee, at No. 208; and the entrance to the two-story church at No. 212. The beige brick facade above was ornamented with faux balconies, giant Moorish-style roundels at the fourth floor, and a tapestry of colorful brickwork at the 15th and 16th floors. The Mediterranean motif was carried on in the tower that disguised the rooftop water tank. 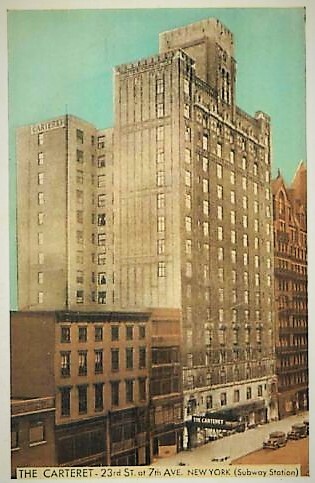 By September 1927, when the hotel was poised to open, The New York Times appears to have accepted the skyscraper church-hotel concept. Calling the Carteret Hotel "One of the important improvements in the old Chelsea district," it noted "It contains apartments of one, two and three rooms for transient and permanent guests." When the hotel opened a few weeks later, fifty percent of the apartments had been leased. The ground floor included a restaurant operated by the hotel. Rev. Whelpley (who, incidentally, had been a lieutenant in the Canadian Army during World War I) continued to exhibit his modern thinking. Around the time the building was completed, he applied for a hack's license. His intention was not to add to the church's coffers with his cab profits, but to "view city life from a taxi driver's seat in all angles." The church entrance, to the right, had a more subdued, ecclesiastic appearance than the hotel entrance under the opulent marquee. On June 12, 1928 The New York Times reported "To get an intelligent insight into life in New York the Rev. Thomas H. Whelpley, pastor of the first of the skyscraper churches in New York...is driving a taxicab...On Sunday, in clerical garb, he preached to a large congregation at his church...Yesterday afternoon, in chauffeur's attire, with his photo on his hack license, he left the Hotel Carteret at 208 West Twenty-third Street, where he resides, and as plain Tom Whelpley drove off in his cab to see a cross-section of life in a big city." Rev. Whelpley explained to the reporter that he thought "it only fair that his sermons to large New York audiences should be founded upon facts of New York life rather than upon second-hand reports." But one cabbie felt the pastor was wasting his time picking up fares in Chelsea. He commented to the journalist "He will only see life along Broadway, among the white lights. No life down this way." The Hotel Carteret's location next door to the famous Chelsea Hotel may have been responsible for its attracting a few notable literary residents. Among the first was British novelist, poet, critic and editor Ford Madox Ford who lived here in 1928 and '29. On January 22, 1929, during what Captain George Fried described as "gales with a very high, rough sea, accompanied by heavy snow and hail squalls," the luxury ocean liner USS America received an S.O.S. from the Italian steamship Florida. Battling the major storm and tracking the distressed ship by radio signals, the America pulled alongside the listing Florida several hours later. Using ladders, ropes, cargo nets and jerry-rigging two breeches buoys (essentially zip lines), the America crew managed to rescue the 32 Italian sailors. Captain Fried was hailed nationally as a hero. Astonishingly, he had pulled off an almost identical rescue on January 20, 1926 when his ocean liner, the SS Roosevelt, rescued the crew of the sinking British cargo ship Antinoe during a heavy gale. The SS America steamed on to New York and the least-injured of the Florida's crew were brought to the Hotel Carteret. On January 28 The Times reported "Twenty-seven battered members of the Florida's crew spent yesterday offering thanksgiving for their rescue and resting quietly at the Hotel Carteret...They will be the guests of the hotel until next Friday, when they will sail for Italy as passengers on the Roma. "The crew, while in a thankful mood, showed little elation yesterday. Penniless and without overcoats, they huddled together in the lobby of the hotel, talking little and showing only slight interest for the strange city into which they had been projected. Most of them had never been in New York before." Despite what the newspaper called their "slight interest" in the city, the men were treated as VIPs. They were the guests of the Roxy Theatre's manager one evening; and hotel residents took them on drives in their automobiles. Another foreigner to visit the Roxy Theatre was Ephraim Rosenberg, who was staying at the Hotel Carteret while studying engineering in the spring of 1930. A native of Berlin, he went to the Roxy on April 9. When he returned to the Carteret, he realized he had lost his pocketbook containing his passport and $947 in cash. A tempting windfall during the Great Depression, it would amount to about $13,400 today. Luckily for Rosenberg, J. V. Pisapia, captain of the orchestra section ushers, discovered the pocketbook. When Rosenberg arrived the next day accompanied by an interpreter, he received everything. Delighted, he offered a reward, but it was declined. Another group of foreigners living at the Hotel Carteret at the time were Soviet workers. One was 28-year old Arkady I. Pogojeff, an agent of the Amtorg Trading Corporation. Among other Amtorg employees in the hotel, according to Pogojeff, were agents of Cheka, the Soviet secret police. Pogojeff was a civil engineer and a graduate of the Moscow Technical Institute. His expertise could have created a comfortable lifestyle in the United States. But he received orders from Moscow to sail for Russia no later than Saturday, March 28, 1931. Pogojeff disobeyed the orders. Basil W. Delgass, the former vice president of Amtorg Trading Corporation confided "He refused to return because he was afraid he would be killed." But refusing a Government order could have its ramifications, as well. Pogojeff told a friend he was afraid he would "meet death at the hands of the Cheka." The Soviets called the alleged murder "ridiculous and preposterous." The official explanation was that Pogojeff had complained of poor health and was advised to take a vacation. Instead, the dejected man jumped to his death. The official police report concluded suicide. A hold-up in the hotel on May 9, 1932 resulted in a bizarre incident. Morris Ferguson and William Smith bound and gagged several people in the hotel before robbing guest Ralph Kahn of $40. They were soon apprehended. But when the 31-year old Ferguson appeared in Jefferson Market Court on June 3, he attempted suicide by snatching the bottle ink from the stenographer's desk and drinking it. The Times reported "Detective Thomas Tunney, brother of [boxer] Gene Tunney, knocked the ink-well out of Fergunson's hand, a keeper administered milk and eggs and a doctor used a stomach pump to remove the fluid, but the patient remained unconscious." Ferguson was taken to Bellevue Hospital. He was back in court on July 8; but this time arrived in a strait jacket and tied to a stretcher. Judge Morris Koenig simply remarked "Such are the technicalities of the law. It is necessary to bring an insane man before the court in this manner to deal with him." Ferguson's lawyer opted not to enter a formal plea, but to substitute an insanity defense. In the meantime, the Chelsea Church's ground-breaking venture was a failure. The New York Presbytery pumped money into the congregation to the detriment of its other work. At a meeting on January 9. 1933 Rev. Dr. Henry Sloane Coffin announced "In order to protect the Chelsea Church, which is in the Hotel Carteret...it has been necessary to pledge the resources of the committee to such an extend that there is absolutely nothing available for any of the work which the committee would like to do." In January 1939 a petition to reorganize was filed. But the handwriting was already on the wall. In 1946 the building was sold at auction for $830,000 after the Chelsea and Greenwich Presbyterian Churches were merged, forming the Village Church. Rev. Whelpley announced that Sunday November 17 would be the last service in the Chelsea Church. He explained to reporters that the building was erected during "the roaring Twenties, when we had the skyscraper-church idea because we though it was a way of keeping up with the times." He now admitted that a church "must be a monument by itself" and not have "semi-commercial" characteristics." The two-story church space was remodeled for the Vanguard Recording Studio. Another Soviet made headlines in the spring of 1963. On May 15 Boris Illashevich checked in. The 58-year old was a language teacher. Shortly afterward he raised the suspicion of a clerk in an upper-Broadway Army and Navy Surplus store when he purchased a United States Army .30-caliber carbine rifle and 15 rounds of ammunition. Police entered his room at the Hotel Carteret where they found the weapon and ammunition. Illashevich was arrested on the charge of possessing a weapon as an alien. He did not offer a reason for arming himself. In 1968 an investment syndicate headed by Nathan Brodsky, Milton Schapiro and Peter Jakobson converted the Hotel Carteret to apartments. The former church-turned recording studio was transformed into a nightclub. Ironically, for years the space where Presbyterians had worshiped was home to Twirl, a dance club frequented by Chelsea's gay community. Today there are 262 rental apartments in The Carteret. The Gotham Comedy Club has replaced Twirl. Other than its regrettable retail storefronts, the building retains Emory Roth's wonderful 1927 flavor, including the multi-paned casement windows and the beautiful marquee. In 1862 Frederick A. Kursheedt took a job in a trimmings factory at the age of 16. The diligent young man thoroughly learned the business. By 1882 he was president of his own firm and had been awarded patents for time and labor savings inventions like his "fluting machine" and "plaiting machine," both of which produced pleats in fabrics. That year in February prominent architect Robert Mook filed plans for a "seven-story brick factory" to replace the old buildings at Nos. 145 through 149 West 19th Street. Frederick Kursheedt had come a long way in twenty years. The cost of his new structure was projected at $55,000; more than $1.3 million today. Mook created an attractive, industrial building faced in beige brick with minimal stone trim. Its three sections were separated vertically by shallow pilasters. The brick was used to give texture and interest in the form of bandcourses, capitals, and cornices. Especially eye-catching was the corbel table between the sixth and seventh floors, which seemed to delightfully echo the campanile of the Palazzo Pubblico in Tuscany. The original brick cornice was shaved and covered at some point. The Kursheedt Manufacturing Company produced a variety of trimmings used by garment manufacturers--plaitings, braids, laces, buttons, and embroideries, for instance. Here hundreds of workers, many of them young girls, worked at a myriad of specialized machines. The building also contained Kursheedt's extensive library of pattern books; books of antique textile designs, and photographs of European and American embroideries and laces from as early as the Renaissance. As was the case with most wealthy businessmen, Kursheedt held directorships in other concerns. While the Kursheedt Manufacturing Company weathered the devastating Financial Panic of 1893, the Madison Square Bank was not so lucky. The bank failed and warrants were issued to its officers and directors to appear before a grand jury in October--including Frederick A. Kursheedt. There was, it seems, a question about the legality of $50,000 in securities that had been sold and a lawsuit to recover $750,000 in funds. Getting the men to appear in court was a challenge. On October 26 The Sun ran the headline "All The Directors Bailed" and reported "On Tuesday afternoon District Attorney Nicoll was informed that Director Frederick A. Kursheedt was too ill to leave his room at the Imperial Hotel." Nicoll was prepared to hold him on a $5,000 bail (more than $135,000 in today's dollars); the same amount as the other directors. Nicoll lost patience with the men and within the month doubled their bail--except for the bank's president whose bond was set at $25,000. It would seem that The Evening World had already decided the men's guilt when it reported on November 28 "How many others were implicated in the looting of the institution was still a mystery" and advised "The prospect of additional developments in the case to-day had aroused curiosity to the highest pitch. It was known that several other indictments were brought in yesterday in connection with the 'wrecking' of the Madison Square Bank." Kursheedt had nothing to say to reporters. Attorneys merely noted "that it was a very disagreeable piece of business." Frederick Kursheedt survived the years-long case with only a temporarily bruised reputation. In the meantime the Kursheedt Manufacturing Company enjoyed such success that in 1906 architects Davis, McGrath & Shepard were commissioned to design an annex next door. On February 10 the Real Estate Record & Builders' Guide reported "A new loft building, to be known as the Kursheedt Building, will be erected at Nos. 139 to 141 West 19th st....The front will be faced with light buff brick and Indiana limestone." The architects renovated the lower two floors of the existing Kursheedt Building to match; replacing with brown brick with beige and updating the openings to more or less meld with the new building. The architects extended the lower floor facade treatment of No. 143 (right) to the older building. Frederick A. Kursheedt died in 1910 and an auction was held on October 10 to liquidate the estate. The two buildings, which shared heating and electricity, were to be sold as a package. The auction was unsuccessful and it would be two decades before the property was sold. While the Kursheedt Manufacturing Company remained in business until 1912, when it was absorbed by Einstein,Wolff, & Co., it left West 19th Street for No. 356 West Broadway. The floors of the Kursheedt Building were leased to smaller manufacturers. In 1913 The American Clothes Drying Company took the ground floor for its showroom. Founded in 1903 it manufactured driers for houses, apartment buildings and institutions such as "police stations, fire engine houses, [and] post offices." The American Clothes Dryer Company's appliances had nothing in common with those used today. The housewife who purchased the residential model could expect to give up a hefty amount of floor space. And the larger affairs--used in apartment houses, for instance--were the size of a large room. Decades before the tumbler was invented, clothes were draped over aluminum bars on asbestos-filled frames which then slid into super-heated compartments. Although the upper lofts were occupied mostly by apparel making firms, there was one glaring exception in 1923. Trouville & Co. was a brokerage firm and its unlikely location, far from Wall Street, was most likely explained late that year. The first years of the 1920s saw stocks rising rapidly. The prospect of quick riches and brokers' offering the purchase of shares with small down payments--some as low as 10 percent--soon had ordinary citizens gambling their savings. One was a Mrs. Huey, who opened an account with Trouville & Co. on March 22, 1923. She placed an order for 100 shares of Kelly-Springfield Tire. Two days later she received her confirmation that her purchase, totaling $6,035.31, had been made. Then came the insistent demands from Vernon Victor Trouville for money. She sent cash and securities totally around $4,000; but then asked for her certificates before providing the balance. That caused a problem for Trouville, who according to Mrs. Huey's attorney, Edwin A. Falk, "presumably never having purchased same, was unable to deliver." The incident sparked an investigation which landed Vernon Trouville in trouble. Attorney General Carl Sherman filed a complaint that said in part "The defendant has been conducting a bucket shop and has made no bona fide purchase, and sale of securities when orders were placed with him." Upstairs the Crown Piece Dyeing Company had a particularly talented employee. Max Berman had owned his own small tailoring shop on East 115th Street in the early 1920s. His debts had accumulated to several hundred dollars, so he applied for a porter's job here. Now he earned $20 a week doing janitorial work. He later told a reporter "my wife and three children were actually facing starvation. I saw an advertisement that Mr. Geller wanted help and I applied, and when he heard my story he gave me a job, although he didn't need me." Berman's most pronounced talents were neither tailoring nor sweeping. It was his voice. Back on East 115th Street he had been known as the "singing tailor." Now, in April 1923 he made his debut at Carnegie Hall. Despite what The Indianapolis Star later deemed "rave reviews," the concert initially seemed a tarnished success. Berman had to pay $100 for the tickets, himself, and his take was just $33. On the bright side, he told a New York Times reporter "Right now I have a chance for four engagements at $500 each in Chicago." The singing janitor went on to operatic success and today the Max Berman Prize for vocal excellence is still awarded annually by the Cleveland Institute of Music. Other similar garment factories like Star Piece Dyeing and Finishing occupied the former Kursheedt Building until the garment district moved north of 34th Street. It became home to a more diverse list of tenants, like Norton Centerpieces, Inc. which moved in in 1950; and the School of Printing in 1970. Then in 1981 the upper floors were converted for residential use--just two massive apartments per floor. Although the 1906 renovations of first and second floors are regrettably bland, and the later entrance can be described as functional; Robert Mook's upper section deserves a look up. The late Victorian double doors were added about the time that the Eighth Ward Mission moved in. Fully aware that the bucolic days of country estates in the area around Greenwich Village were coming to an end, in 1788 the Bayard family hired Theodore Goerck to map out streets and building plots on their land. The western boundary between their estate and Richmond Hill (the house on which would become the vice-presidential mansion the following year) was called MacDougal Street. It was named for patriot Alexander MacDougal (who at some point dropped the second L from his family's surname, MacDougall). Fervently anti-British, he was a founder of the Sons of Liberty, along with activists like Samuel Adams, Benedict Arnold, Patrick Henry and Paul Revere. During the war he rose to the rank of major general and succeeded Benedict Arnold in commanding West Point. Given MacDougal's anti-royalist sentiments, it is ironic that the street named in his honor terminates at its southern end at Prince Street. By the 1820s Georck's streets and building lots had moved from paper to reality. The plot at No. 49 MacDougal would not be developed until the early 1840s when a row of brick-fronted homes were erected. The 21-foot wide houses, built as speculative investment, were intended for well-to-do families. Unlike the Federal style houses erected nearby a generation earlier the attics of which featured peaked roofs with dormers, the Greek Revival homes had full-height third floors (albeit slightly shallower than the lower levels). The steep brownstone stoops, tall parlor windows, and severe stone pilasters and entablatures of the entrances were expected in the style. The upscale tone of No. 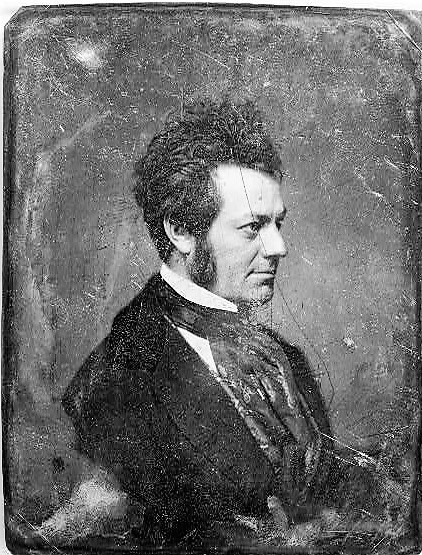 49 MacDougal Street was reflected in what may have been its first tenant, the celebrated actor Edwin Forrest, who moved in in 1843. By now the Shakespearean actor, whose career started in Philadelphia at the age of 11, had also made his mark in Europe and London. While touring in England in 1837 he married Catherine Norton Sinclair. Trouble soon followed. Famed photographer Matthew Brady made this portrait of Edwin Forrest. from the collection of the Library of Congress. Soon after returning to New York, Forrest embarked on a road trip. When he returned he found his home filled with in-laws and his housekeeper complained that "the place had been filled with scenes of revelry and disorder during his absence." To distance himself from his overbearing relatives, Forrest leased and bought a succession of residences--sometimes, but not always, living with Catherine. When he testified in their widely-publicized and scandalous divorce case (Catherine was accused of numerous sexual affairs) in 1850, he recounted his string of homes. Among the addresses, he said that after residing two years on Broome Street, "in 1843 I resided [at] No. 49 MacDougal street; after that I resided [at] No. 284 Bleecker street." His stay in the MacDougal Street house was at least two years, because he later produced a lease dated February 1844. The house was sold at auction on April 6, 1869 with John Cohen placing the winning bid of $12,600. The price would be equivalent to about $226,000 today. Cohen apparently overspent because four days later an advertisement appeared in The New York Herald announcing No. 49 MacDougal would be re-auctioned. "The above sale will be made for the account of N. Cowen [sic], a former purchaser, he having failed to comply with the terms of sale." The house became home to the John Dunn family. Dunn's wife, Eliza, was a dressmaker and his daughter, also named Eliza, was a teacher in the Primary Department of Grammar School No. 30 on Baxter Street, near Grand Street. It appears that Dunn died around 1873. That year on April 19 Eliza placed an ad in The New York Herald: "A Dressmaker wishes a few more engagements by the day or week; best references." The following year, on June 25, Eliza died in the MacDougal Street house. Eliza E. Dunn remained in the house, unmarried. But her school teacher salary was, it would seem, not enough to maintain the property and she came up with a creative solution. Following the Civil War the neighborhood had seen drastic change as freed blacks and waves of low-income immigrants moved in. Missions cropped up in an effort to help the impoverished new residents. One of these was the Eighth Ward Mission, founded by Mrs. Mary Laidlaw in 1877. Her focus was on orphan boys too old to be accepted into orphanages but unable to support themselves. While Eliza Dunn still lived in her house, Mary Laidlaw opened her Eighth Ward Mission House here, accepting up to 14 teen-aged boys. A reporter from the New-York Tribune explained "At that age, she says, boys are more in need of a guiding hand than when younger, as they are then ambitious to be manlike and they imitate alike the good and the bad. She found that boys of fourteen who were at work seldom received more than two or three dollars a week which was barely sufficient to rent a small, ill-ventilated room, to say nothing of their board." Mary Laidlaw's venture was highly successful and soon the MacDougal Street house was being used only as the Mission's offices. A mission house and school were erected on Houston Street. On July 22 1883 the New-York Tribune noted "Ten boys live in the mission house and a class of seventy, composed of bootblacks, newsboys and street boys, meets there for study and instruction. In addition to this work there is a sewing-class for women, meeting once a week and numbering forty, while a similar class for girls has sixty members." Through the sewing classes, women found a means to add to their struggling families' incomes; while girls were trained for a job. The Directory of the Charitable, Eleemosynary, Correctional and Reformatory Institutions pointed out in 1892 that the "industrial school for poor girls from 8 to 15 years of age" which was opened on Saturdays had more than 75 students. "The garments made by the children are distributed among them." The Directory added "In addition, the poor families of the neighborhood are visited and assisted in cases of necessity." Although the Eighth Ward Mission accepted private donations and City help (in December 1878 the Board of Apportionment granted $400 to its operation), the wealthy Mary. Laidlaw paid almost all the operation expenses herself. In November 1890 the Eighth Ward Mission received an unexpected and generous donation--a millionaire's summer estate near Ossining, New York. "It consists of a comfortable and spacious home, which was recently the country house of a benevolent gentleman who came to the conclusion that the best he could do with it was to place it at the disposal of Mrs. Laidlaw in aid of her generous work," wrote The Sun on November 9. Mary Laidlaw explained "There will continue to be an office in New York city for the reception of such orphans or other boys as may be entrusted to the institution by their parents or guardians. The effort will be to fit these boys for self-support, and to obtain for them permanent employment." The New York City office of the Mission continued to operate from No. 49 MacDougal Street for several years. When exactly Eliza Dunn left is unclear; however it was purchased in April 1892 by Francis H. Leggett, apparently as a gift to the Mission. He spent $13,800 on the property; more than $370,000 in today's dollars. The down-and-out condition of some of district's tenement dwellers was evidenced on January 18, 1894 when Eighth Ward Mission distributed food as part of the New-York Tribune's Coal and Food Fund. On that frigid winter morning 20 families lined up to receive a package of hominy, a bag of beans, one package of codfish, a package of oatmeal, one of rice, one of tea, and two cans of condensed milk. In some cases, the food was taken to the families. The New-York Tribune described some of the heartrending cases. In one basement apartment, "a family was found without food or fire. The older children in this family have brought the younger children to school this winter barefooted. When their mother took the groceries tears came to her eyes, and she kissed the hands of those who gave them out." And, the article went on, "Perhaps the most pitiful case there was that of a family whose mother died yesterday morning. The father has been out of work for a long time, and none of the nine children can earn any money. The oldest girl came to the school crying bitterly. She said: 'My mother has died, but can I not get the food? We need it so badly." The Eighth Ward Mission offices left MacDougal Street around the turn of the century. By 1902 it was being run as a rooming house. William B. Stoops died there at the age of 50 on January 7 that year. Later, in September, James Lynch was arrested for committing voter fraud by misrepresenting his address and, thereby, his election district. The neighborhood soon gained the moniker of Little Italy and the tenant list of No. 49 MacDougal Street filled with Italian surnames through most of the 20th century. Perhaps the first glimmer of change came in 1952 when two young men moved into an apartment here together. One of them, who went by the stage name Tish, soon became a Greenwich Village celebrity of sorts. The female impersonator got his first job at the Moroccan Village. Silvia Sanza of The WestView News interviewed Tish 60 years later. "That's where he started wearing wigs and exquisite gowns," wrote Sanza on May 3, 2017. "He sang French standards in the style of Edith Piaf and 'Gonna Wash That Man Right Outta My Hair' as Mary Martin from South Pacific." The houses to the left, built simultaneously, were originally near matches to No. 49. The Greek Revival ironwork of the stoop and areaway of No. 49 survive intact. Although the orange-red brick has been painted gray and the windows replaced; little else has outwardly changed to No. 49 MacDougal Street. Its quiet presence successfully hides its remarkable history. In April 1891 architect George Fred Pelham filed plans for seven "three-story and basement stone dwellings" on the south side of West 71st Street, between Amsterdam and West End Avenues for developers Edelmeyer & Morgan. Each house was projected to cost $12,000, or about $322,000 today. Completed in 1892, Pelham had designed them in a restrained version of Romanesque Revival. Stretching from No. 212 to 224, it appears their mostly subtle differences were arranged in an A-B-C-D-C-B-A arrangement. The last of the houses was sold by Edelmeyer & Morgan in October 1892. The $24,000 price for each doubled the developers' investment. No. 212 was purchased by attorney Eugene Van Schaick and his wife, the former Sarah Howland. The couple had been married six years when they moved into the house. Sarah, apparently not content to sit at home, dabbled in real estate. The same month that they bought No. 212, Sarah sold the three houses at Nos. 152, 154 and 160 West 65th Street to George Moore. The lucrative contract totaled $83,450; about $2.25 million today. When John W. Merriam and his wife, Louise, purchased the house in 1905, it was assessed at $21,000. John was the principal in Merriam Segars, Inc. The title was put in the name of Louise, and she immediately set out to made significant changes. On September 22 that year architect Carlton Strong filed plans for $12,000 in alterations. In part, they included "new plumbing, tubs, entrance and rear addition." The new entrance mentioned in the plans involved removing the brownstone stoop and lowering the doorway to the former English basement level, a few steps below sidewalk level. 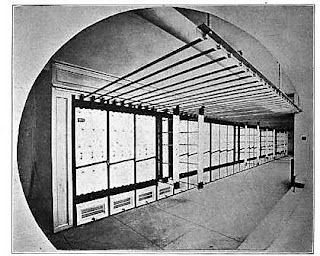 Based on the extent of the renovations--equaling a third of a million dollars today--it was doubtless that at this time the projecting bay with its tiny panes and stained glass insets was installed. The upper two floors remained unchanged. Small leaded insets added decoration to the grid of small panes. The new "tubs," plural, suggest that the Merriams intended to operate a rooming house here. And, in fact, although the couple continued to live here, when they sold No. 212 in December 1915 to the Ellay Realty Co. it was termed a "tenement." Before long a similar fence, around six feet tall, surrounded the areaway of No. 212 West 71st Street. Now owned by William Kemp Kay, the house had been remodeled into a swanky nightclub, the Iron Gate. The New York Times described the layout, saying "The basement is used as a kitchen, the first floor has a dance floor, foyer and bar; the second a lounging room and woman's bar, the third floor booths and the fourth a storeroom." No small affair, the Iron Gate employed 20 hostesses per shift in 1932, as well as musicians, dancers, chefs and others. Dorothy McCoy and Anita Corbin worked at the Iron Gate that year. The last thing proprietors of speakeasies wanted was publicity; so William Kemp Kay was no doubt annoyed when the women, both 22-years old, were arrested on September 12 that year. Described by The New York Times as "two night club dancers," the women had been in the automobile of Harvey Lyons on August 25 when it plowed into a group of children in New Jersey. Several children were injured and 8-year old Dorothy Balamie died. At the time Lyons was arrested; but, according to the newspaper "asserted that one of the dancers was at the wheel at the time. Both denied having driven the automobile." It may have been that tragic incident that drew federal interest to West 71st Street. On December 23 six undercover prohibition agents posed as customers. Once served, they flashed their badges and arrested Kay, his manager, the bartender, Joseph Parroti, and two waiters, Leo Alfond and Leo Weisslitz. Fifty bottles of liquor were confiscated. The Times reported "a capacity crowd of guests were not disturbed. Agents told reporters that the furnishings in the high-end club were worth $50,000, more than $865,000 in today's dollars. It appears it was not Prohibition, but the disgruntled neighbors who brought an end to the Iron Gate. On October 3, 1935 The New York Times reported "The Iron Gate, a restaurant and bar at 212 West Seventy-first Street, said to have been a favorite resort of former Mayor James J. Walker, was the object of the action brought by the Neighborhood League for Noise Prevention." Dr. Maurice D. Pitney, a psychotherapist who lived at No. 220 West 71st Street, had had enough. He told reporters that loud music and singing, mainly "Hawaiian," blared from the Iron Gate "from 8 P.M. to 4 or 5 in the morning," making sleep impossible for him and his neighbors. A meeting was held in the home of Mrs. Madge Stover, next door to the nightclub at No. 210, and a protest petition was started. The Iron Gate was by now run by Arthur W. Kemp, possibly William's son or brother. He was slapped with a summons for maintaining a public nuisance. It was apparently death knell for the Iron Gate. A little over a month after the neighbors revolted, No. 212 was sold to insurance broker Leo Salomon "for investment." In reporting the sale, The Times noted "The building is now vacant." 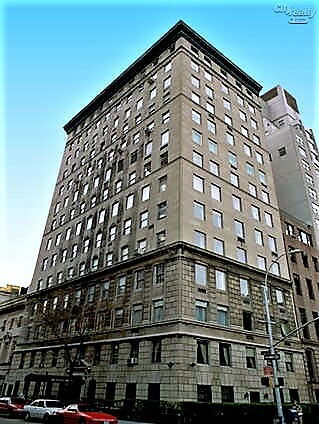 Salomon formed the 212 West Seventy-First Street Corp. and maintained the property for about two decades. In stark contrast to the rowdy nightlife during the Iron Gate years, the house was now occupied by at least two vocal studios. Carl A. Yost trained classical vocalists here during the 1930s and early 40's. Among his star students was composer and baritone Elmo Russ. Yost regular staged recitals in his studio and Russ was perhaps his most frequent performer. In 1939, for instance, The Musician reported, "In the highly atmospheric and appropriate setting of Carl A. Yost's Studio, Elmo Russ, vividly gifted composer-baritone, presented another of his diverting programs on June 1st, offering lyrics by Edna St. Vincent Millay." Another voice teacher, Mario Rubini-Reichlin, had his studio here for years. Born in Vienna, he had been professor of piano at the Vienna Conservatory of Music and a concert pianist in Austria until the Nazis came to power. He fled to America, taking up the profession of a voice coach. He died at the age of 70 on October 7, 1968. By then No. 212 had been renovated to a single apartment on the ground floor and two each on the upper floors for a decade. In 1995 it was purchased by Dr. Moshe M. Rothkopf and his wife, Ziporah. The former basement level was converted for Dr. Rothkopf's medical practice in 1998. The brownstone has been painted white and Pelham's carved Romanesque elements picked out in a garish gold; possibly a legacy from the 1930s nightclub. Nevertheless, Carl Strong's interesting 1905 bay makes No. 212 a standout on the block. And the tall iron fence, an attempt to foil Prohibition agents, survives. By the mid 1880s wealthy New Yorkers were abandoning "Millionaires' Row" below 59th Street and erecting fine residences on Fifth Avenue along Central Park. Speculative developers, too, joined the trend and in 1885 Charles T. Barney completed a mansion on the southeast corner of Fifth Avenue and 63rd Street. Barney had commissioned Robert H. Robertson, with whom he already had a working relationship, to design the residence. The Philadelphia-born architect was known for his personal take on the popular Romanesque Revival style. For the Barney project he married that style with the emerging Queen Anne. Clad in red brick and stone, the completed house was a visual feast of angles and shapes. 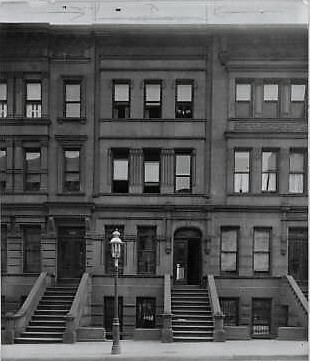 While the entrance above a dog-legged stoop was on 63rd Street, the residence took the more impressive Fifth Avenue address, No. 817. Robertson's signature Romanesque Revival style--appearing only at the second floor--took back stage to Queen Anne. By simply chamfering the corner above the second floor, Robertson gave the impression of a two-story setback. A profusion of stained glass transoms, a riot of angles and shapes, and a delightful mountainscape of dormers and peaks at the attic level were all typical Queen Anne elements. In May 1885 Barney sold the newly-completed residence to Clarence Ashley Postley for $100,000. But the new owner had even grander ideas in mind for the house. He immediately brought Robertson back to enlarge it by creating a seamless extension on the plot at No. 2 West 63rd Street. The $10,500 project brought the total cost of the mansion to what would today amount to about $2.8 million. Postley came from a long line of military men. His great-grandfather was an officer in the Revolutionary War; his grandfather, Charles Postley, was an officer in the War of 1812; and his father was General Brooke Postley, "commander during the Rebellion of the famous Hussar Brigade," as described by historian William Van Rensselaer Miller in his 1894 Select Organizations in the United States. Miller added that the Postley family traced its New York roots "to its earliest history." Clarence, too, started out in the military. He graduated from West Point in 1870 and served in the Third U. S. Artillery, and was an instructor of mathematics at West Point for five years. In 1874 he married Margaret Vincent Sterling. The couple would have two children, Elise (known popularly as Elsie) and Sterling. In 1883, two years before buying the Fifth Avenue mansion, Clarence retired. He turned his attention to what he most enjoyed, club life, horses and yachting. His club memberships included (but were not limited to) the University, Union League, Players', New York Athletic, Hamilton Park, New York Jockey, Coney Island Jockey, New York Yacht, American Yacht, Corinthian Yacht, Larchmont Yacht, and Seawanhaka Yacht Clubs. The family (including Postley's parents) had barely moved into its new home before Clarence addressed a neighborhood problem: the Menagerie in Central Park at 64th Street. He signed a protest to the Board of Estimate in November 1885 which complained, in part, "The noise and confusion that naturally attends upon public exhibitions of this kind, tends materially to disturb the peace and comfort of those who reside in its immediate vicinity." (Interestingly, enough, within a few years Clarence would be a supporting member of the New York Zoological Society.) Other signatures on the petition gave a hint of the Postleys' exclusive neighborhood, among them William Rockefeller, Ogden Mills, James Sinclair, John J. Sloane, Henry Marquand, and Richard M. Hoe. Later Harry Brown, in his The History of American Yachts and Yachtsmen, noted "Commodore Postley occupies one of the most palatial residences on Fifth avenue, where his system, order, taste and geniality have established one of Greater New York's ideal houses of the rich, from when flow commerce and prosperity, while his popularity is universal." Margaret and Clarence appeared regularly in the society columns. On February 5, 1892, for instance, The Epoch reported "A very handsome luncheon given by a very handsome hostess in an equally handsome house was that last Tuesday of Mrs. Clarence Postley of 817 Fifth avenue...The floral decorations were very beautiful and the favors for each lady consisted of dainty baskets filled with lilies of the valley while to the basket's handle was attached an exquisite spoon with a bowl of rare enamel." The couple threw themselves into a newly-popular activity in 1895--indoor bicycling. They joined the "number of prominent society people riding at the Bidwell-Tindham Academy" on 59th Street. The New York Times reported "Both are delighted with it, and Mr. Postley has become so enthusiastic that he proposes to form a small private club and engage a hall for riding purposes at once." In the meantime Sterling was eyeing prospective brides. On January 5, 1896 The Times reported that "Stirling [sic] Postley...gave a theatre party last night at Daly's Theatre for Miss Elsie Norton of Albany." Following the performance, "a supper and informal dance followed at Mr. Postley's house, 817 Fifth Avenue." Two years later Sterling had made his selection. On November 13, 1898 the San Francisco Call announced the engagement of Miss Ethel Cook, daughter of Mrs. Horace Nelson Cook, to Sterling. The New York Times called her a "reigning belle of San Francisco." Ethel had earlier made headlines when Grand Duke Boris of Russia drank champagne from one of her slippers at a banquet, declaring her "the most beautiful American woman" he had ever seen." Like his father, Sterling was more interested in clubs and yachting than business. But his sporting life was almost cut short by a serious attack of typhoid fever in 1900. He and Ethel lived in his parents' Fifth Avenue mansion, where he convalesced. On August 24 The Times reported on his slow recovery, saying his condition "has kept Capt. and Mrs. Postley and the patient's sister and wife in town all Summer." But the newspaper was optimistic. "When his recovery is complete Mr. Postley, with his wife and mother, will probably go abroad for a few months." Sterling, of course, did recover. His father, in the meantime, focused on his yachts. Earlier that year he had the Colonia refurbished for the second time. In 1897 he had had it altered to a schooner rig, receiving a bill for $20,000. Now, on July 8, 1900 the New-York Tribune reported he "has received his new steam yacht Colonia from the hands of those who altered her interior." And then in August that same year he purchased the steam yacht Alberta. Outing, a monthly sports and travel magazine, commented "Mr. Postley has won so many cups and other trophies that he now stores them in a burglar-proof safe." 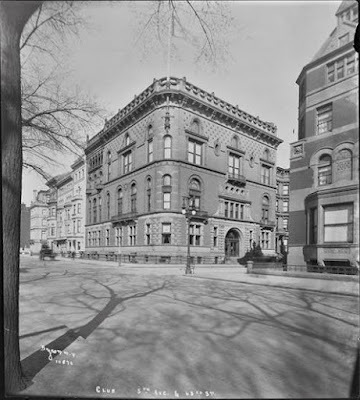 On the morning of January 4, 1901 General Brook Postley left the mansion around 10:30 headed for the Eighth Avenue streetcar. The conductor noticed the 86-year old man in the crowded car and found him a seat. He later noted "he appeared to have a chill, as he trembled and pulled his coat collar close about his throat." Postley suffered a heart attack on the car and died before an ambulance could arrive. Clarence identified his father's body at the police station, and also explained the two guns in his coat. "The presence of two revolvers, found in the dead man's pockets, was explained by his son, who said that his father was very fond of going to the theatre, and for that reason had obtained a permit to carry a revolver, as he was often out late. He supposed that his father had put the second revolver in his pocket, forgetting that he already had one." The general's funeral was held in the Fifth Avenue house on January 7. Despite his distinguished military history, there was no fanfare. The services were private with only a few intimate friends invited. The expected mourning period was slightly abbreviated for Elsie's debutante entertainments, which began with a reception in the house on December 7. They continued through the winter season, terminating on March 31, 1902 when Margaret gave a dance. The New-York Tribune noted "it took place in the small ballroom." Rather than going to their summer estate in Belle Haven, Connecticut that year, Margaret and Clarence went on an automobile tour abroad. On October 11 Automobile Topics reported they "recently left Paris for England, taking with them a brand new 16-hp. Panhard-Levassor. Having exhausted the automobile resources of the environments of Paris, they will try the suburbs of London." On October 16, 1904 the Postleys announced Elsie's engagement to Ross Ambler Curran. The wedding took place in the Church of the Heavenly Rest on November 1, followed by a reception in the Fifth Avenue mansion. The extended family spent the winter season of 1905-06 in Paris. During Christmas week Margaret and Clarence gained two grandchildren. Elise had a son, followed a few days later by Sterling's and Ethel's baby boy. No. 817 Fifth Avenue remained closed for another two years. Finally, on May 2, 1908 the New-York Tribune reported "Mr. and Mrs. Clarence A. Postley, who have been abroad for nearly three years, are booked to sail from Paris for New York to-day." The couple had only just returned to the house when tragedy struck. On May 28 Clarence suffered a fatal heart attack in mansion. Margaret retained ownership of the house, which was valued at $370,000 (in the neighborhood of $9.3 million today). But she would no longer live there. Only a week later the New-York Tribune reported that she, along with Elsie and Ross, had taken rooms in the Plaza "where they will remain until they sail for Europe next month." Three years later both Sterling and Elsie would make headlines for bizarre marital entanglements. In January 1911 Elsie divorced Ross Ambler Curran in Paris. Two months later, on March 12, The San Francisco Call reported that Ethel had divorced Sterling, also in Paris. The article noted "The reason Ethel Cook got a divorce was because Sterling Postley 'was always hanging about the house.'" That was not quite the case. Shortly afterward, Ethel married Ross Curran, her former brother-in-law. And then things got even more complicated. In May 1911 Ross Curran's brother, Guernsey, married Elise. Now Elise and Ethel were once again sisters-in-law. Newspapers world-wide reveled in the gossipy story. One headline read "Love Gone Amuck Among Millions" and another proclaimed "The Romances of the Idle Rich Currans." In the meantime, Margaret leased No. 817 Fifth Avenue to Raymond Hoagland and his family. The Hoaglands had lived at No. 23 West 52nd Street until selling it in 1909. The Times called that residence "the largest house on the block with the exception of the Vanderbilt mansions." Hoagland's father, Joseph C. Hoagland, had founded the Royal Baking Powder Company and garnered an immense fortune. Joseph Hoagland's massive Newport summer estate, Auldwood, encompassed 175 acres. In the late 1890s Raymond erected his own cottage, Kristofelt, on Bellevue Avenue just north of Auldwood. The family also maintained a summer home in Seabright, New Jersey. While Clarence Postley had been known for his yachts, Hoagland was known for his horses and he was a regular exhibitor in the society horse shows. He was married to the former Rosa Porter. Their son, Joseph, graduated from Cornell in 1911 and the following year his engagement to Eleanor Sheldon Prentice was announced. At the time, the end for No. 817 Fifth Avenue was drawing near. After several years living abroad, Margaret Postley returned to New York in October 1914, taking apartments at the Ritz-Carlton. She died there on November 7, 1915, leaving an estate of more than $3.7 million (nearly $74 million in today's dollars) which was divided between Sterling and Elise. Within months No. 817 and the mansion next door, the former Robert L. Gerry residence at 816, were demolished; replaced by George B. Post & Sons' Italian Renaissance apartment building known simply as 817 Fifth Avenue. Abijah Pell, Jr. was born in New York City on November 8, 1811. His was an important family, tracing its roots in America to the 17th century. John Pell inherited the Pelham estate from his uncle, Thomas Pell, in 1670, and became the first lord of Pelham Manor. Abijah's parents, Abijah and Mary Baldwin Pell, owned considerable land in Greenwich Village and when the elder Abijah died in 1826 his seven children--five sons and a daughter--shared equally in the sizable estate. In the decade before the outbreak of Civil War spotty development was taking place along East 58th Street near the East River; until only recently green farmland. Tax records indicate a house appeared by 1857 at what could be numbered 311 East 58th Street, when title to the property was in name of Charles Shute Pell. It does not appear that Charles ever lived in the quaint brick-faced house. He and his wife, both educators, were appointed superintendents of the New-York Orphan Asylum by 1857 and as such would have living quarters there. Instead his brother, Abijah, listed his address as "East 58th near 2nd" in the early 1860s. As a matter of fact, it may have been Abijah who constructed the house. He was described as "a leading builder of his day" by The Memorial Cyclopedia decades later. Pell was married to Eliza Brown Ward. She was the first cousin of New Jersey Governor Marcus Ward. The couple had three sons, Abijah, William and Charles. Despite their lofty pedigree, the extended Pell family was apparently well in tune with the condition of the less fortunate. Both Charles and Abijah were long-term members of The New York Association for the Improvement of the Condition of the Poor, for instance. Nevertheless, they moved socially among their peers. All the Pell brothers were members of the venerable St. Nicholas Society which included only men descended from New York's earliest families. When Abijah's 48-year old brother, Aaron, died on November 8, 1861 of consumption, his funeral was held in the 58th Street house two days later. Abijah had joined the Union Army only a month earlier. When a comrade, John R. Hobby, died "of disease contracted in the army," on October 20, 1865, once again a funeral was held in the Pells' parlor. The notice instructed mourners it was "second house east of 2d-av." In the spring of 1870 the Park Commissioners directed the North and East River Company and the Central Park Railroad Company to lay "double tracks in Fifty-eighth-street." The intention was to provide a crosstown connection between the First Avenue and Eleventh Avenue streetcars. Local protest was quick and forceful, with Abijah Pell leading the charge. On May 7 "a large number of property-owners" met at the Terrace Garden, on 58th Street near Third Avenue. The New York Times reported they gathered "for the purpose of protesting against the laying of a track for a horse-car railroad in that street." Abijah Pell presided that evening. Among the results of the meeting was the formation of a committee to raise funds for an expected legal battle. Three years later Abijah Pell died in a bizarre and tragic accident in Newark, New Jersey. On Saturday morning, April 19, 1873, was run over by the "pusher," or engine used to move train cars. He died the following day. The 58th Street house was sold to John B. Huse and his wife, Emma. Huse was a printer with a shop on Hudson Street. He also apparently dabbled in real estate. In September 1873 he advertised "A store to let on Seventh Avenue--inquire at 311 East Fifty-eighth street, or in confectionery, No. 9 Seventh avenue." Huse was adamant that his property would not be used as a saloon. His ad stressed "will not be rented for liquor store." On September 1, 1877 Huse sold the "two-story brick dwelling" to Henry S. Cohn for $8,000--just under $190,000 today. Cohn flipped the house for a tidy profit, selling it four weeks later, on October 5, to Mathias Down for $10,000. Although the Prussian-born Down was listed as a merchant, his main income most likely came from the several tenements he owned throughout the city. In February 1890 he commissioned architect Charles Stagmeyer to add a two-story extension to the rear at a cost of $1,500. The enlargement may have had to do with Down's grandson, Mathias Herman J. Weiden's moving in. Both Down and Weiden were listed in the house in the 1890s. Weiden (who went by the name Herman) and his wife, Margaret, had one child, Josephine, who was born in 1906. He was active in New York's German community and served on the Executive Committee of the National Federation of German-American Catholics during the World War I years. Despite anti-German sentiments during the war, it often went by the name of the Catholic Central Verein of America. Weiden would remain an active member through the 1950s. It appears that Margaret had died by 1920 when only Weiden and Josephine were listed as living in the 58th Street house. His marriage on Wednesday, February 15, 1928 was marred by tragedy when Catherine McMurray, his new mother-in-law, died two days later in her Brooklyn home. 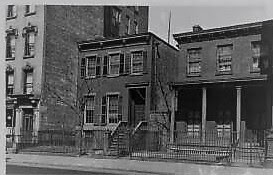 On December 30, 1950 The New York Times reported "After seventy-three years in the family of Mathias Weiden, the two story brick dwelling...at 311 East Fifty-eighth Street has been purchased by Charles Jones, music composer, for occupancy." The musician moved in with his wife, Sally. Born in Canada in 1910, he had come to the United States at the age of 18 to study violin at the Juilliard School (his father, incidentally, was an American citizen). He became a pupil of, and then assistant to Darius Milhaud at Mills College in Oakland, California. The two worked together at the Aspen Music School where Jones became Director in 1970. Throughout his career he also taught at the Music Academy of the West in Santa Barbara, the Juilliard School and the Mannes College of Music. His compositions included an oratorio on Piers Plowman, four symphonies, and nine string quartets. Jones was still teaching composition at Mannes and Juilliard when he died from complications of heart surgery in June 1997. The remarkably-surviving little house was sold the following year to The Philip Colleck Gallery for $1.1 million. The gallery, established in the 1930s, deals in 18th century English antiques. According to the firm's president, Mark Jacoby, several months after the purchase "Part of the charm of the building is that it has its original doors, mahogany banisters and wide pine floors, all of which we're keeping. We're keeping the room configurations as well. There are seven different fireplaces on the three floors, and a large rear garden that we're going to beautify." The new owners hired architect Peter M. Bernholz to design the gallery. At the same time the coat of what Jacoby described as "old blueberry-yogurt paint" was removed from the brickwork. As if the history of the house were not amazing enough, local lore insists that Tennessee Williams rented a room here in the 1930s. In fact, he lived across the street at No. 316. And that is perfectly fine. The remarkable survivor does not need a celebrity to stand out; its excruciating charm is enough. The building replaced two 1810 houses like the one to the right. During the Civil War construction in New York City came to a near halt. But with the return of the work force, new projects soon got underway. One of these was Jacob Pecare's store and loft building which replaced two 1810 houses at Nos. 39-41 West Broadway, between Duane and Thomas Streets, in 1867. Pecare was educated as an attorney, ran an importing business, and invested widely in real estate. He hired Alfred A. Dunham to design his five-story structure, to be called the Commercial Building. The architect turned to a commercial take on the Italianate style. The cast iron storefront featuring fluted Corinthian columns upheld four stories of "Ohio Freestone." Early in 1868 John W. Kennion, writing in The Architects' and Builders' Guide, reported the nearly-completed building. He described the upper floors as being "of an original elaborate design, having large openings for windows, very essential in a building of this description." The Corinthian-style cast iron columns of the store front were carried on throughout the cavernous interiors to support the floors above. Kennion remarked that the Commercial Building was "considered as a first-class building, and a good investment." Dunham's handsome upper facade was framed by neat quoins that ran the height of the building. A busy cast cornice completed the design. But it was his treatment of the openings which no doubt prompted Kennion's "original elaborate design" comment. The molded window surrounds of floors two through four were uniquely decorated--incised floral designs at the second, blind rondels at the third, and interesting pedestal-like cornices on the fourth. Even the more traditional, fully-arched Italianate openings of the top floor boasted unusual carved enframements that sat on attractive brackets. The structure cost Pecare $32,000. And so when he sold it to Richard Mayer in September 1868 for $60,000 (just over $1 million today), he indeed proved the prediction of a "good investment" correctly. Mayer seems to have included his brother, Bernhard, in the purchase; but like Pecare their interest was purely an investment. Among Mayer's first tenants was Farnham & Co., dealers in men's underwear--a product that would not seem a tempting target for burglars. Nevertheless, on Christmas Eve, 1869, Thomas B. Baker (who coincidentally was a baker) was arrested as he was about to enter his home at No. 46 Thomas Street about a block away. The New York Herald reported "He had at the time in his possession nine dozen of men's drawers, valued at fifty-four dollars, the property of Farnham & Co., Nos. 39 and 41 West Broadway, which he had stolen." The haul would be worth about $970 in today's dollars. The underwear thief was held at $1,000 bail to answer the charge of burglary and theft. The considerable commercial development of the area required improved infrastructure. In 1870 the city installed a 12-inch cast iron water main down the center of West Broadway to handle the demands of the many new loft buildings. By the time J. E. Levy & Co. moved into the second floor around 1873, the name "Commercial Building" had fallen away and only the address was being used. Garment manufacturer, J. E. Levy & Co. was looking for "a second-hand friction glaze calendar; also a set of Drying Cans and Copper Roller" on April 6 that year. The equipment was used in adding luster and smoothness to the surface of fabrics. Two weeks later the firm placed another advertisement, seeking "A lady cutter on aprons." Winn & Weaver, wool merchants, moved from No. 61 Barclay Street about this time. Charles G. Weaver was not only wealthy, but busy. He was also the president of the National Bank of America of New Jersey. Winn & Weaver would call the building home for decades. Also operating from No. 39-41 West Broadway was Charles C. Carpenter. His company, C. C. Carpenter, manufactured bustles, a must-have accessory worn under female fashions. Most 19th century garment factories required workers to supply their own thread and needles. Carpenter went a step beyond. 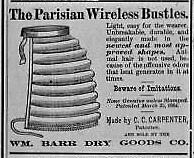 His advertisement in The New York Herald on February 27, 1876 noted "Operators on Muslin Bustles Wanted--With their own machines." Carpenter's workshop was busy. In 1889 he employed 30 men, 8 boys under 18, 4 boys under 16, 80 women, 30 girls under 21 and 15 girls under 16. The staff worked an average of 54 hours a week, not including weekend shifts. In 1881 the Clasp Envelope Co. moved in to the building. The firm did apparently well, for it was repeatedly looking for workers. In 1883 it wanted a "Boy, living in Ninth ward, as errand boy and to make himself generally useful." The following year in March it advertised for "Experienced envelop folders wanted; also claspers; work given out." The mention of "work given out" referred to the practice of what was also called "home work," so women with children, for instance, could do the piece work off site. A want ad placed on September 11, 1887 by Clasp Envelope would no doubt raise eyebrows today. "Wanted--Six smart girls about 15; light work." The extent of Winn & Weaver's business was evident in November 1880 when Edward Haigh, proprietor of the Valley Woollen Mills in Newburg, New York, filed for bankruptcy. The Carpet Trade Review noted "Mr. Haigh was known to have considerable business relations with Winn & Weaver, of West Broadway." In fact, the article reported "it is rumored" that he owed the firm $10,000, or about a quarter of a million today. 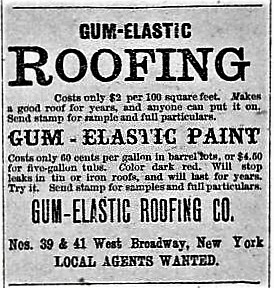 Joining the eclectic mix of tenants in 1890 was the Gum Elastic Roofing Co. Dealers in roofing felt, the company advertised nation-wide for years. West Broadway had been a source of confusion to New Yorkers for decades. Originally Chapel Street, in the 1840s it was unofficially being referred to as West Broadway (there was an East Broadway, too). Finally in the 1850s the city relented and renamed it--except for College Place. The three block stretch between Barclay and Warren Streets was named College Place in 1830 and was not affected by the West Broadway change. But in the spring of 1895 the city proposed a project of widening College Place, while connecting West Broadway to South Fifth Avenue. The improvement would create one continuous thoroughfare from Dey Street to Washington Square. And businessmen, including those in No. 39-41 West Broadway saw a problem. A petition was sent to the mayor on March 18 suggesting "the entire street should be given the name of West Broadway for its entire length." The city fathers agreed and in 1897, with the project completed, Nos. 39-41 received its new address of 137-139. Charles G. Weaver died at the age of 74 on December 19, 1896. While Winn & Weaver continued for a few years; his death was almost a symbol of the changing complexion of West Broadway. By 1903 the old firms like Clasp Envelope were gone, replaced by an Adams Express branch on the first floor and mostly shoe firms above. The Tribeca neighborhood in general had been the center of the shoe industry for decades; but by the end of World War I it engulfed Nos. 137-139 West Broadway. The Wallace Rubber & Shoe Co., wholesale jobbers, were here as was shoe wholesaler P. A. Sawyer & Co.
John J. McGrath had been a major shoe manufacturer, based in Salem, Massachusetts, since the first years of the century. In April 1922 he and C. S. McGrath partnered with Rudolph M. Klein to form the McGrath Shoe Company. The new corporation was headquartered in the West Broadway building. McGrath Shoe Company produced high-quality footwear. Their "British type" mens' shoe called the Charing Cross sold for $12.75 in 1938, over $200 today. Rudolph Klein left work as usual on Wednesday evening, April 14, 1937. While driving through the business section of the village of Smithtown, Long Island, the 53-year old suffered a heart attack. His out-of-control automobile smashed into a parked car. Klein apparently died before the impact. The second half of the 20th century saw Tribeca factories replaced with residential lofts, restaurants and galleries. The dance studio of Batya Zamir was in No. 137-139 West Broadway by the mid-1970s. Zamir had appeared with the Alwin Nikolais and the Murray Louis Companies in the 1960s. Her avant-garde approach was epitomized in her "Rebound" solo presentation here in March 1976. New York Times critic Anna Kissellgoff called it "a work replete with virtuosity and athleticism and one that suggested that Miss Zamir is on the path to opening up a new genre of movement possibilities." That "new genre" had to do with Zamir's "dancing" in the air. Richard Van Buren had designed "rubberized tightropes" which were attached to pillars and one wall. Dressed in a leotard and silver pants, Zamir also utilized trapeze-type rubber loops. Kissellgoff described "Throwing herself against the rubber ropes, she was propelled in various directions with a speed that would have been impossible on her own." "Rebound," of course, was just one of the ongoing presentations Zamir staged here before all tenants lost their leases around 2008 for renovation to residential space. What may have been upheaval for the displaced occupants turned serendipitous in the early hours of Friday, August 7, 2009. After 139 years, the cast iron water main laid in 1870 finally erupted. By 5 a.m. the water had risen to four feet deep in some buildings. West Broadway collapsed and buckled in two places and several buildings had to be evacuated. Among the flooded structures was No. 137-139 West Broadway. Renovation, of course, went on, falling short of cleaning the facade or improving the internal design to make removal of the distracting fire escape possible. Nevertheless, Dunham's handsome post-Civil War structure is remarkably intact. Even the cast iron storefront is nearly perfect, down to the Victorian double doors. In 1839 the grid of streets and avenues, laid out in the Commissioners' Plan in 1811, began slicing up the farmland in the district known as Yorkville. The New York and Harlem Railroad had been extended along Fourth Avenue (later Park Avenue) two years earlier, with a station at 86th Street. The neighborhood became even more accessible in 1852 when the Third Avenue Railway System opened streetcar service. The residents of Yorkville were mostly blue collar immigrants from Germany and Ireland. But some were more affluent--shopkeepers and factory owners, for instance. 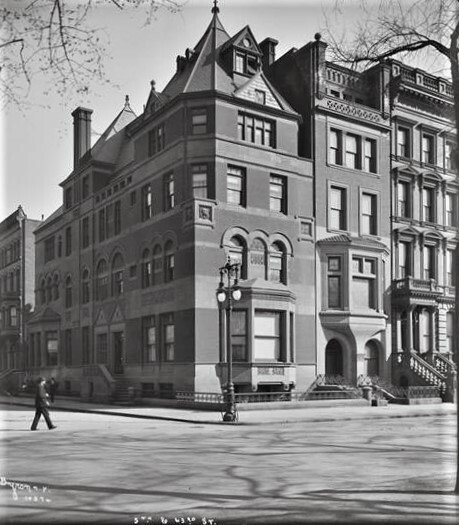 Two mirror-image houses were built on East 83rd Street in the years just before the outbreak of the Civil War that targeted the latter. Mirror images, Nos. 222 and 224 East 83rd Street, between Second and Third Avenues, were three stories tall above a shallow English basement. Faced in brick, they sat back from the property line, creating garden space between the stoops. Each two bays wide, they were crowned by wooden Italianate cornices supported by ornate leafy brackets with paneled friezes. By the early 1870s No. 224 appears to have been operated as a boarding house. Sisters Emma and Carrie Adams lived here from 1874 at least until 1884. Emma taught at Grammar School No. 36 on Ninth Avenue, making $760 in 1881. Carrie was a teacher in the Girls Department of Grammar School No. 42 far downtown on Allen Street. She made slightly less than her sister, making $684 in 1881--or about $16,400 today. If the house next door was still a private residence in 1880, that was about to come to an end. Real estate operator Eliza Gardner purchased it at foreclosure auction in December that year, paying $5,500--five dollars more than the amount due on the mortgage. Although Gardner lived in Paramus, New Jersey, she regularly invested in Manhattan properties. James E. Morrissey, who had been a clerk in the Tombs Prison for more than three years, was married in November 1894. He and his bride boarded at No. 222. Two months later, on the evening of January 14, 1895, he left work "apparently in perfect health," according to The New York Times. But the following morning his wife found him dead in their bed. The newspaper reported "It is supposed that his death was caused by heart disease." A little over a decade later the houses would be struck by a string of deaths. In 1910 the Bureau of Census reported increases in fatalities from typhoid fever, measles, and influenza. It may have been these rampant diseases that caused the succession of funerals that were held in Nos. 222 and 224 beginning in 1909. On August 6 that year, Herman Witt died in No. 224. Five months later Charles B. Berger died on January 23, 1910; and Abraham Otto died on June 22. Three weeks later William H. Gardiner died next door. And on October 31, 1911 Joseph Oppenheimer died in No. 224. The Great Depression brought change to the two boarding houses. Architect Lloyd E. Mellor converted No. 224 "for business" that year. No. 222 was already home to the Flatiron Window Cleaning Company. One of its employees, 55-year old Walter Tholin, was killed on September 21 that year when he lost his balance and fell from a window ledge on the fourth floor of C. H. Gallagher's brownstone house at No. 141 East 47th Street. The conversions of the lower floors of both houses resulted in broad shop windows and a modest cornice at the parlor level. The stoops and the upper floors were left intact. In 1960 No. 224 was converted to two apartments; while its next door neighbor continued to be home to small businesses--the Veteran's Caning shop in the 1960s, followed by Such Outlandish Stitches, which described itself as "a miraculous boutique." Then in 1974 it, too, was converted to a parlor floor apartment below a duplex, with a florist shop in the basement. The greatest change came in 2005, however, when the interior walls were broken through and the joined houses became a single family residence. It was most likely at this time that the architecturally-incongruous, neo-Classical inspired surrounds were tacked to the upper story openings. Oddly, their fluted pilasters abruptly end with no bases; making them appear almost like skinny shutters. Despite the alterations, the quaint garden-fronted pair, nestled back between apartment buildings, create a charming Victorian scene.